Stephen W. Kuffler contributed to neuroscience through his exceptional discoveries, as well as by selecting and mentoring pupils who later became leaders in their fields. Among many world leaders, he supervised and mentored the Nobel Laureates David H. Hubel, Torsten Wiesel and Eric R. Kandel. To celebrate his work and achievements, as well as to recognize his lasting influence, the Stephen W. Kuffler Foundation aims to support the scientific development of young talents in life sciences and awards the Stephen W. Kuffler Research Scholarship for students studying in Central European Universities. After receiving the awards from the Nobeln Laureate Thomas Südhof, the winners will give short scientific presentations. Bősz Emilia, cognitive science MSc, MBE. CV pdf. Hegedűs Panna, medical student, Semmelweis Egyetem ÁOK. CV pdf. Ignácz Attila, biology MSc, ELTE TTK. CV pdf. Kiss Krisztián, biology MSc, ELTE TTK. CV pdf. Kolostyák Zsuzsanna, medical student, DE ÁOK. CV pdf. Székely Virág, bioengineering MSc, BME. CV pdf. 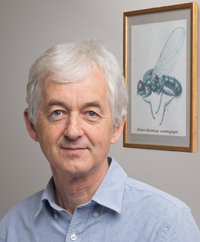 Director of the UK Medical Research Council Anatomical Neuropharmacology University Unit and Professor of Neurobiology at The University of Oxford received the Semmelweis-Budapest Award in 2012. In his acceptance speech he announced his wish to dedicate the ten thousand EUR prize to a foundation to be set up for supporting young talent and named after Stephen W. Kuffler (1913-1980), on the centenary of Kuffler’s birth in Hungary. Former pupils and colleagues of ‘Steve’ joined the initiative. Further generous pledges by the family, fellow scientists and the general public made it possible for the “Stephen W. Kuffler Research Foundation” to be registered with the Hungarian authorities, in Budapest. Faculty of the Department of Anatomy & Neurobiology, University of California, Irvine, in honor of Professor Ivan Soltesz for his contributions as Chair of the Department.